Do you ever envy your kids? I sure do. Basically ALL THE TIME. They are living their best lives, that’s for sure. Especially this summer! 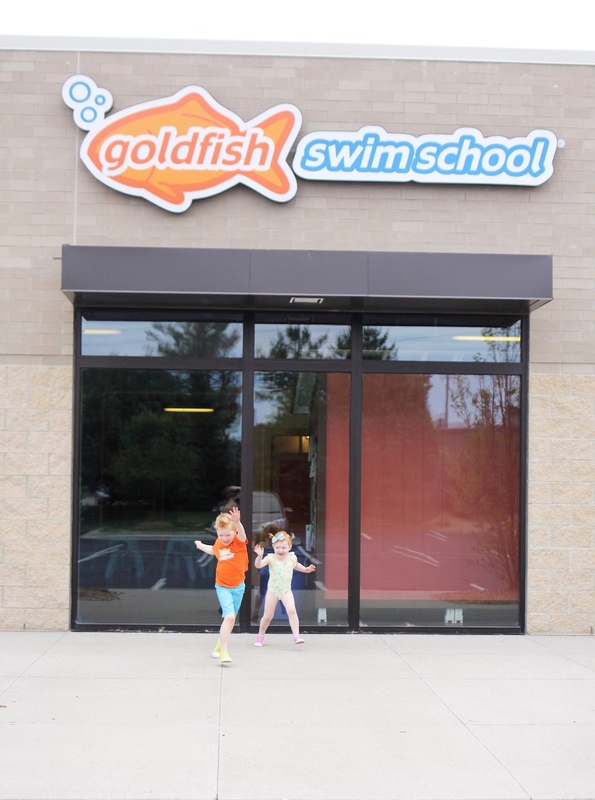 We signed Hudson and Sadie up for swim lessons this summer at Goldfish Swim School of Grand Rapids and they are having a blast! 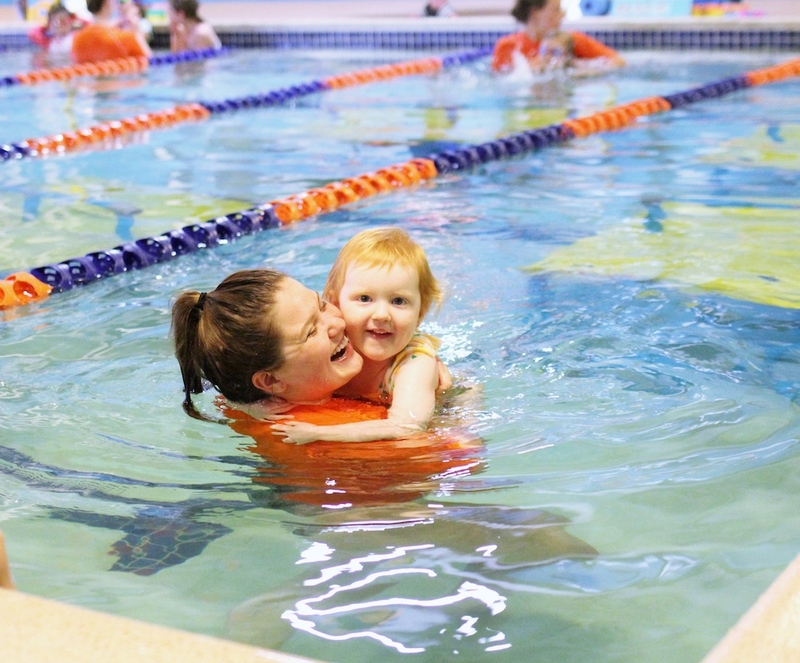 Hudson started swim lessons there when he was three years old and continued until I had Belle last year. 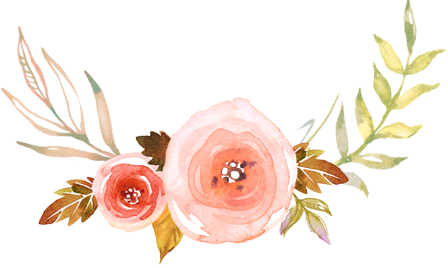 We took a short break but are thrilled to be back. And after a year of watching Hudson swim, Sadie is SO excited to be able to participate too. It’s her first official activity! Can you feel their enthusiasm? If you are anything like me, the thought of watching three kids (one day) swim in the pool is a little bit scary and overwhelming. 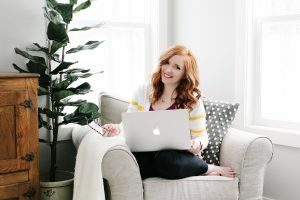 We are totally outnumbered and although we are pretty vigilant (especially now because our kids are so little) it is extremely important to me that my kids learn how to swim and how to be safe around the water. We spend a lot of the summer up at my mom’s lake house….which means a lot of swimming in the lake or in her community pool. So I set out a goal for Hudson for this summer: learn to swim and be confident in the water. And he is totally up to that challenge! 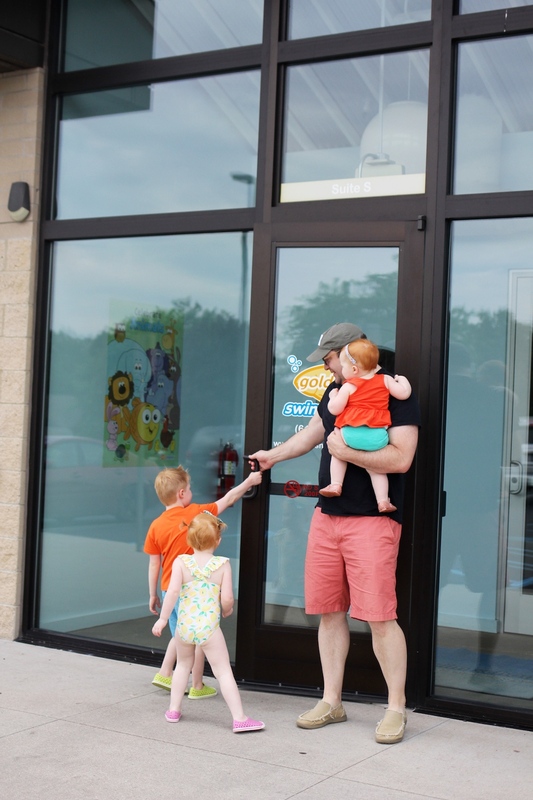 One of the things I LOVE About Goldfish Swim School in Grand Rapids is that they have created such an inviting child-oriented environment and safe place where kids can learn to swim, overcome their fears, respect the water, and have lots of fun while doing it! 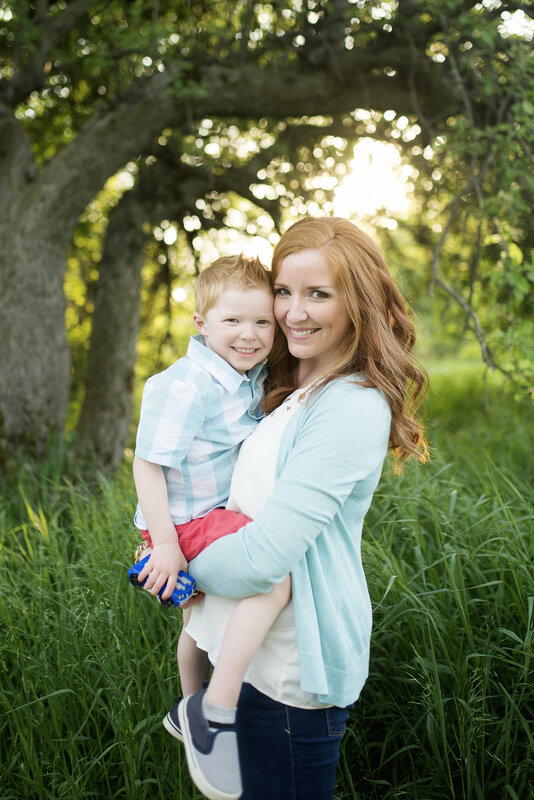 As a family owned business, everyone on staff really takes the time to get to know you and your child….and that as a parent is invaluable! 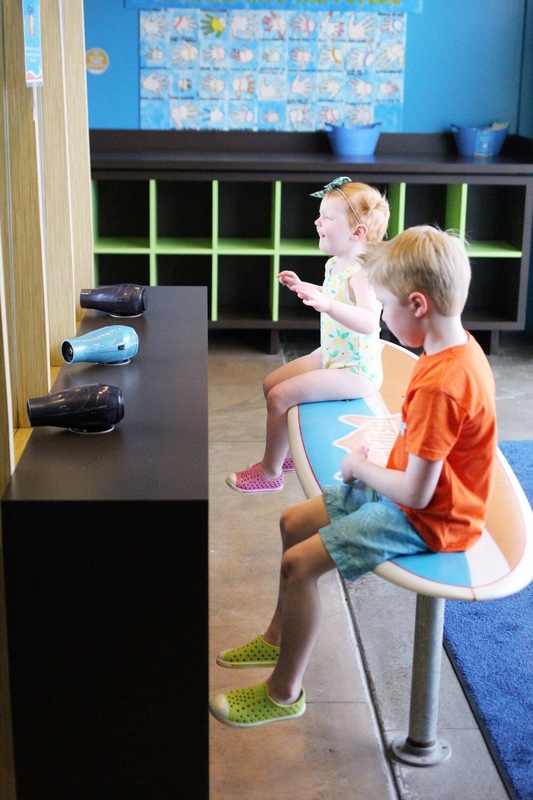 As soon as you walk in the building, you are instantly transported to an under the sea adventure….and it is so fun! Everything is indoors, so lessons run year round. 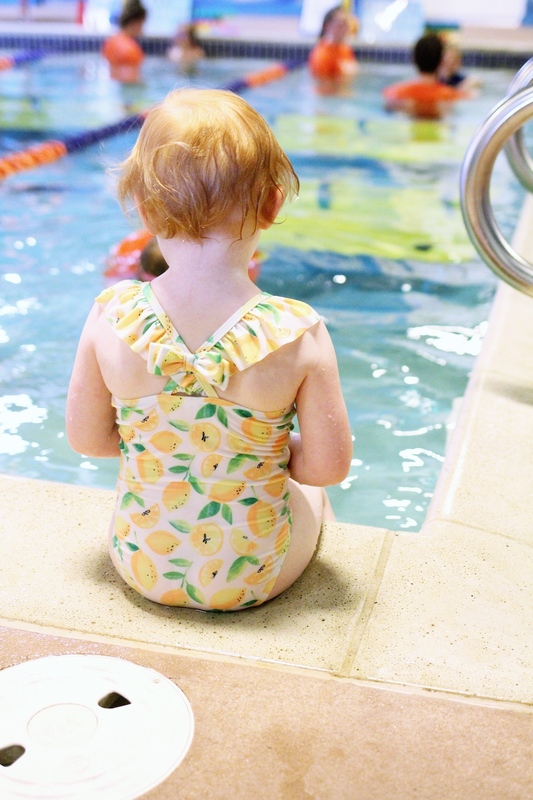 The pool is always heated to 90 degrees, which is great for kids since they don’t have to jump in to a cold pool….they can get started with swimming right away. 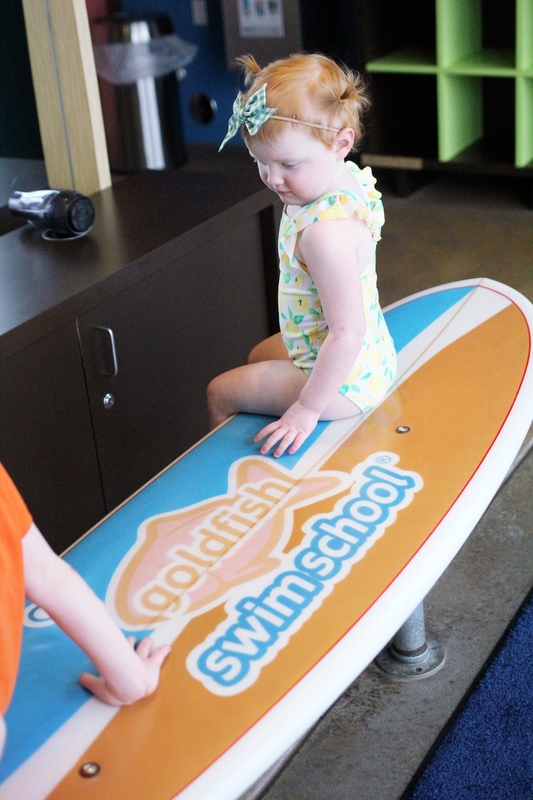 At Goldfish Swim School in Grand Rapids they have such a great set up for families. 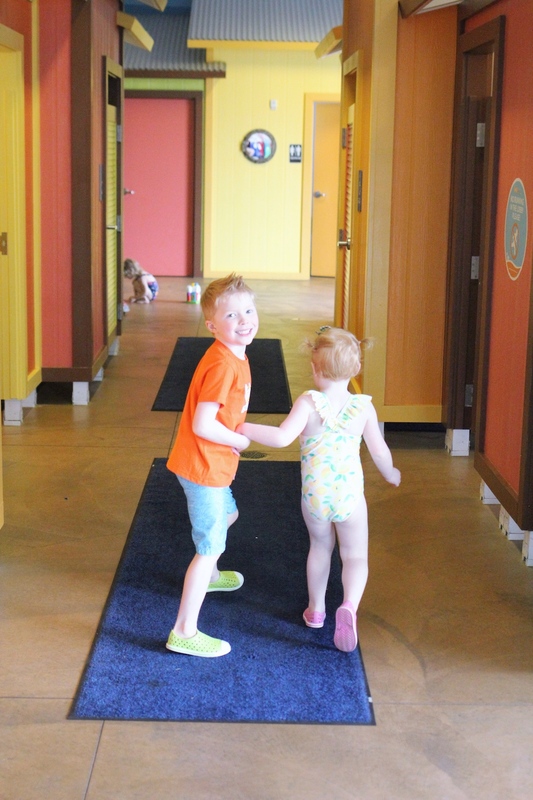 They have multiple private changing rooms, several large private bathrooms, showers to rinse off after swimming, swimsuit dryers, a hair drying station, and lots and lots of toys for kids to play with while they wait. 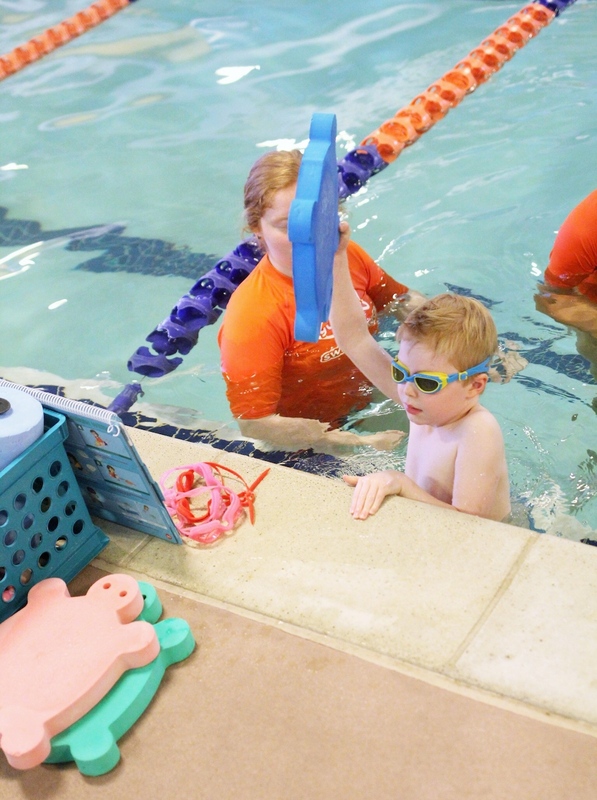 Hudson’s swim instructor immediately greeted him by name, was enthusiastic about the lesson, and made him feel comfortable and excited to swim with her! He had two instructors the day I took photos because one was in training. Class sizes are capped at 4 students so everyone gets lots of one-on-one instruction. 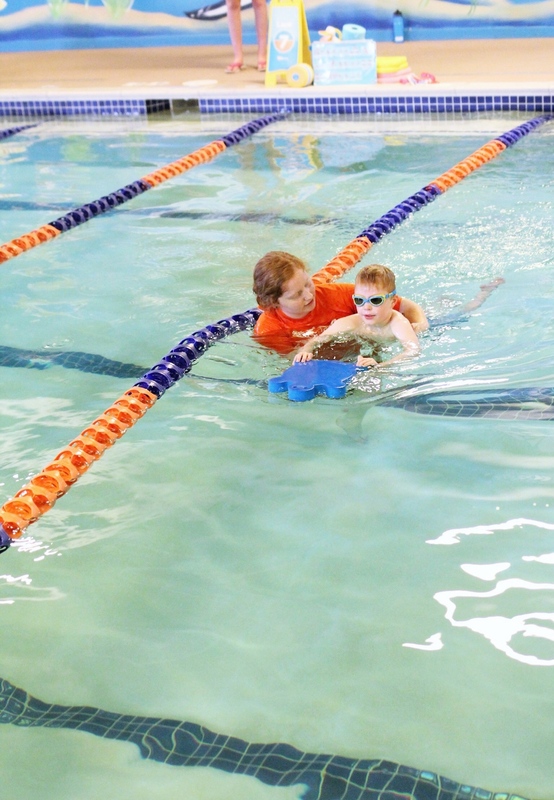 Hudson is a pro already and was SO excited to get back to swimming lessons. 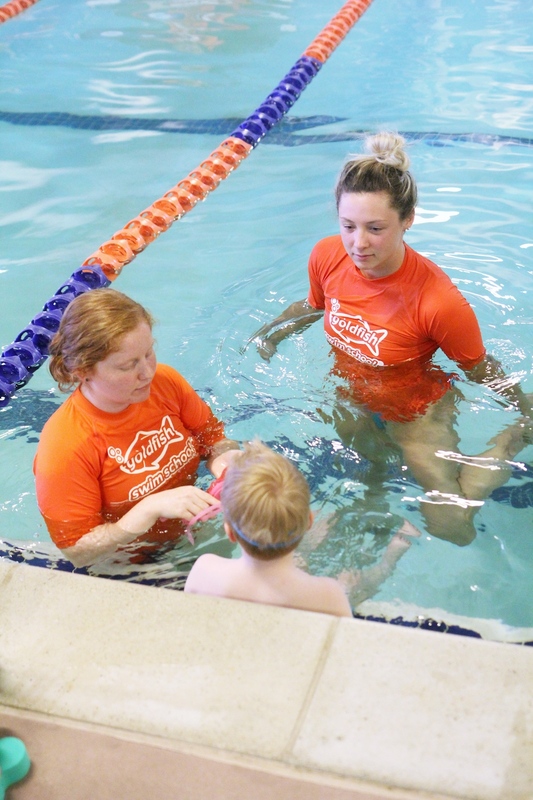 Unlike traditional swim lessons that are only offered on predetermined dates during specific seasons, Goldfish Swim School offers perpetual lessons year round. 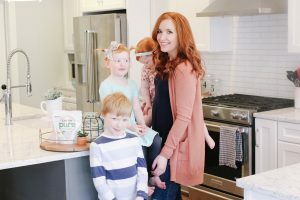 This model is perfect for our family! 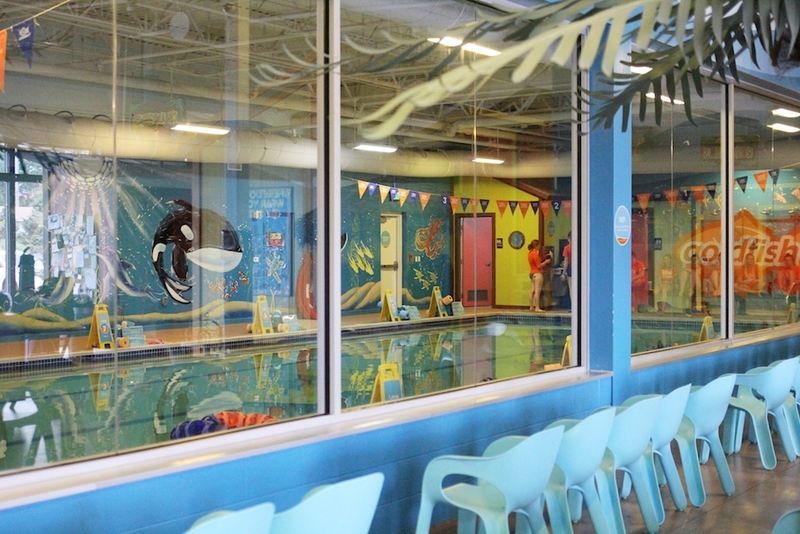 Meeting once a week for a swim lesson helps keep the kid’s swim skills sharp while still fitting in to our busy schedule. They also offer flexibility when you have to re-schedule…just call ahead and you can book a different day or time. So easy! Fo Sadie, this was all so new. She was used to watching Hudson take lessons, but this was the first time she got to get in the water too. 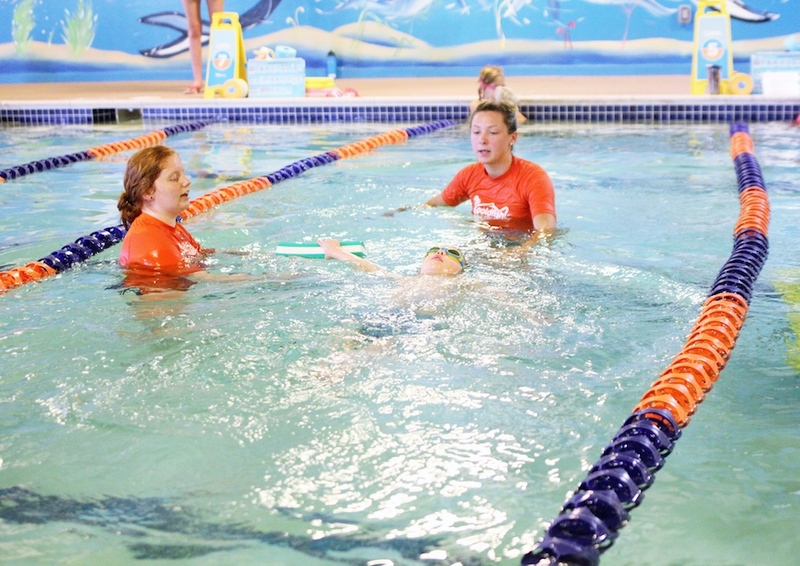 Goldfish Swim School offers swim lessons for children ages 4 months to 12 years. We talked A LOT in the week leading up to her lesson about what to expect. She’s my more timid child and clings to me whenever we are in the pool together. So I told her that her instructor would hold her during her lesson and make sure she didn’t fall. But of course she quickly learned there was nothing to be scared of! Her instructor was so kind an patient with her and made her feel comfortable. I was expecting tears from her…but she rocked it! Sadie kept saying “my teacher hold me!” over and over when she was done. And she LOVED it! 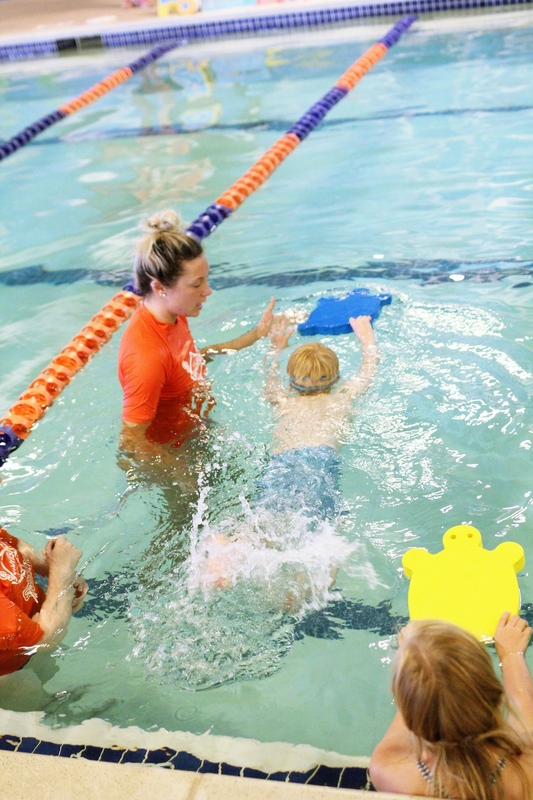 Another thing I love about Goldfish Swim School is not only do they teach swimming skills, they also incorporate water safety in to their lessons. 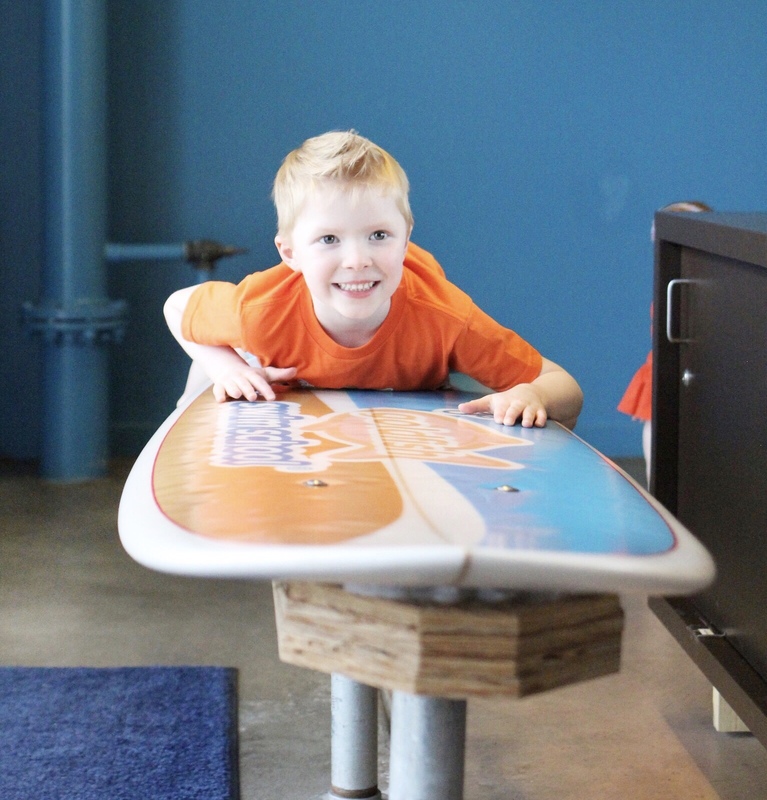 It’s such a fun and positive environment for kids to learn and grow. 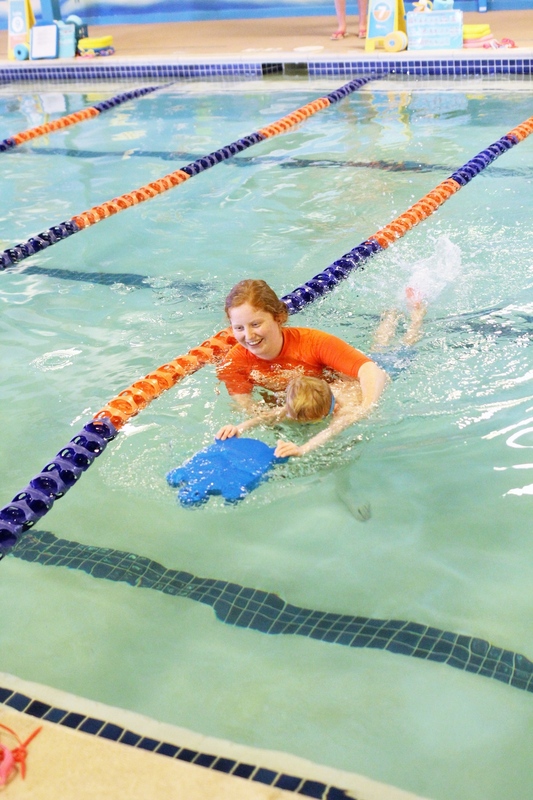 And as a parent I love knowing that my kids are learning how to be safe around the water. Jon and Belle love watching our little swimmers in action! 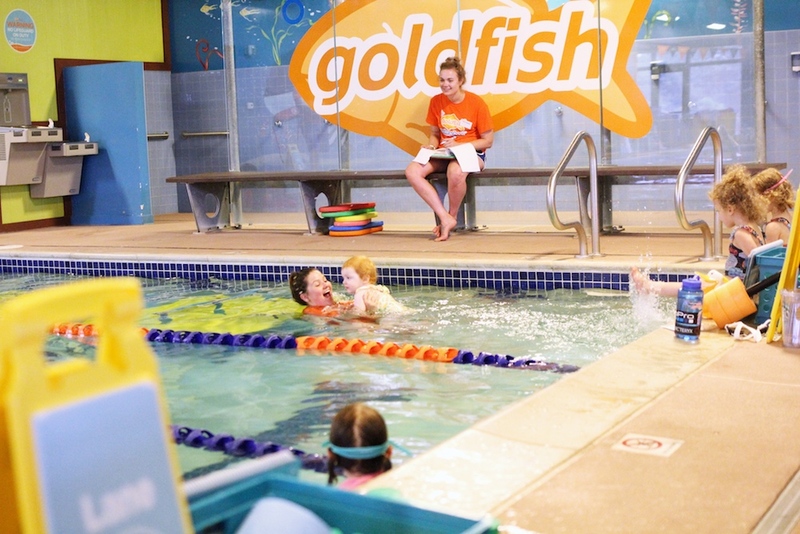 At Goldfish Swim School of Grand Rapids they also offer family swim time, which is such an added bonus! 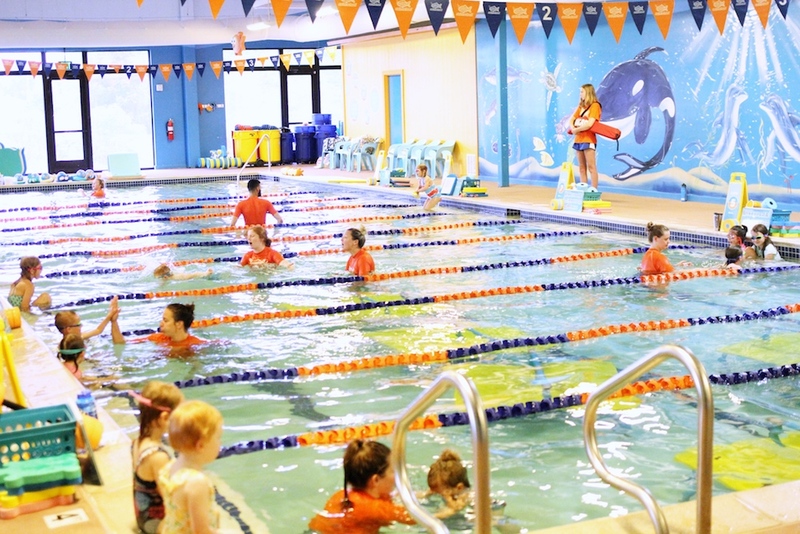 I can get in the water with my kids and watch them practice their skills. 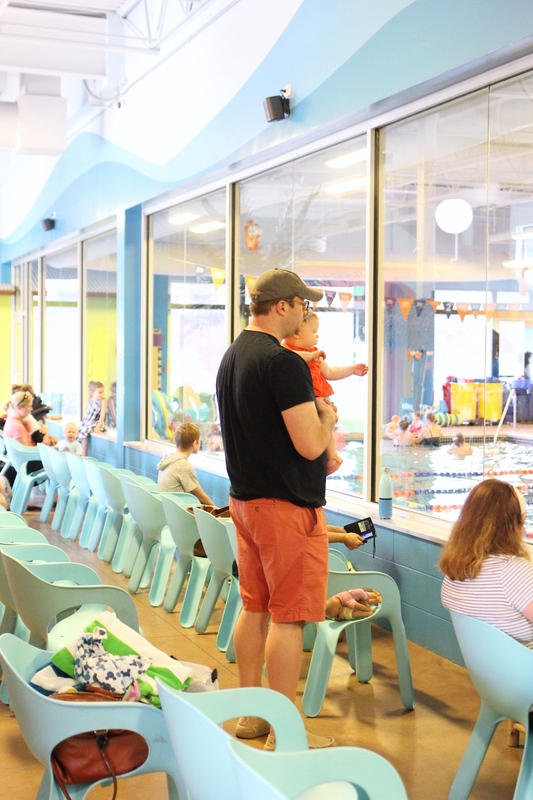 If you are local to Grand Rapids and thinking about trying out swim lessons I have some AMAZING news for you….I’m partnering with Goldfish Swim School to give away one punch card good for SIX family swim sessions*! Enter below! 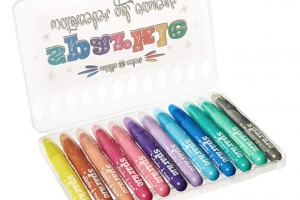 *giveaway open to US residents, age 18 and over. Must live near Grand Rapids, Michigan. The Girl in the Red Shoes is not responsible for safety of winners. 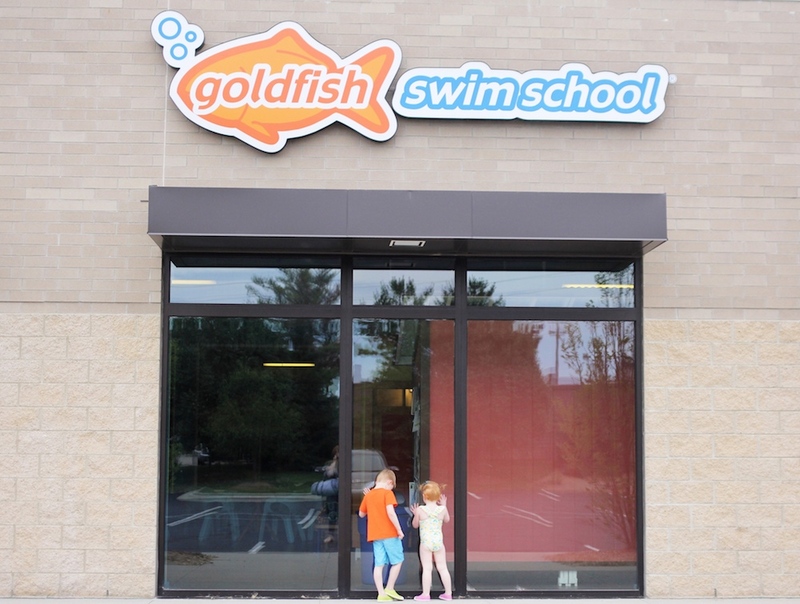 This post is in partnership with Goldfish Swim School of Grand Rapids , but all thoughts are my own! SO want to win this!! We’ve been heavily debating on taking our girls there since we also spend lots of time at The Lake in the summer! Definitely want smart, safe swimmers!! Also, both my girls have the lemon suit that Sadie does… So cute! 🙂 looks like your kids have a great time there!! 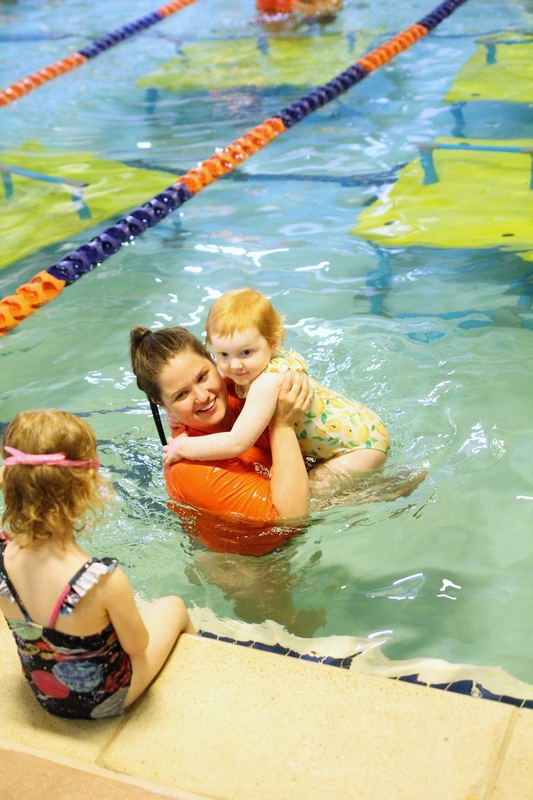 My 5 year old took swim lessons when she was one at the YMCA. 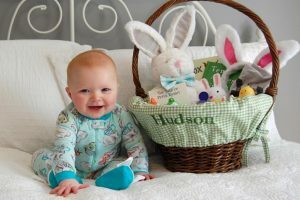 Now that we have three kids I find it hard to make time for that type of stuff. But they love the water and I would really like them to know how to swim without a life jacket. Love following your adventures around our city! Would love to get my kiddos in some lessons!